A synergy of essential oils designed to help you breathe. 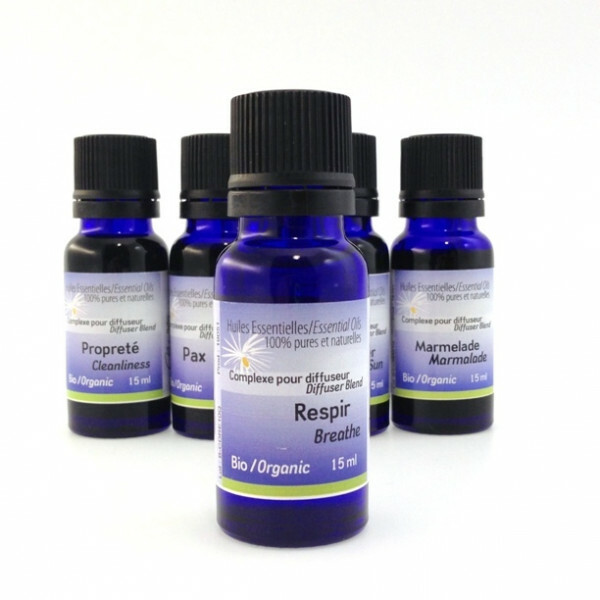 RESPIR was designed to be used in your diffuser (electrical or passive). It contains a selection of mild, non-irritating essential oils helping the respiratory system. These oils cleanse the ambient air and, just like a walk in the woods, enhance your mood and awareness. Ingredients: Balsam fir, eastern white cedar, black pruce, Norway pine and yarrow. Properties: Mucolytic, expectorant, antiseptic, anti-allergenic, anti-inflammatory. Indications: Cold, flu, asthma, allergies. This blend can be used during winter season to clean the air and clear lower respiratory airway. Pour 1 or 2 ml in the diffuser. Depending on the intensity chosen, the diffusion can last between 15 minutes and a couple of hours. Also, pour a few drops in the hollow of your hand, rub hands together and then place it on your face in order to form a mask. Breathe slowly and profoundly with each nostril, from 3 to 4 times.